It's been a long time coming but this SATURDAY JANUARY 19th (today) both SubCultured Toronto and Conscious Wave will be teaming up for a live takeover of the legendary Dubplate.fm airwaves (scroll to bottom for full details). The collab will be much what you'd expect from the collectives including but not limited to best in underground dubstep, drum & bass, grime & much more with lots of surprises. The stream will be broadcasted live chez Aphotik in beautiful Collingwood, Ontario and will most likely feature an appearance by performer Amber's Infinite Circles. 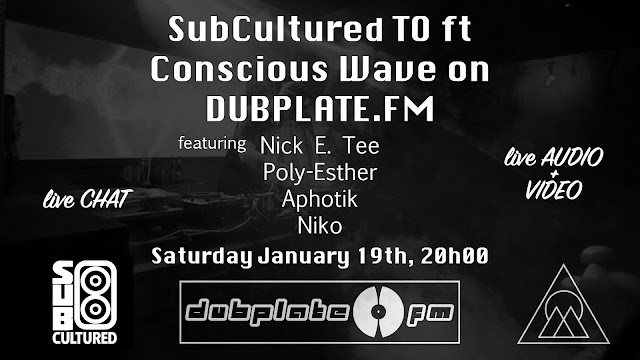 The MAIN high quality audio stream and live "Dub & Bass Chat" will be hosted on Dubplate.fm, while the video stream will be hosted on Twitch, Chew.TV, Periscope, Facebook (who usually take it down) and Twitter. join the MAIN conversation live in the "Dub & Bass Chat"
SubCultured Toronto is a Toronto-based collective promoting bass music events in the city of Toronto, and beyond -> conscious community // collaborative culture. Conscious Wave is a Canadian artist collective, event production company, SUB FM radio show and online music platform, exploring soundsystem culture, festival culture, bass culture and more.